Welcome to BKs Palmerston North Motor Lodge. Our names are Gail and Kelvin and together we are the managers of the business. 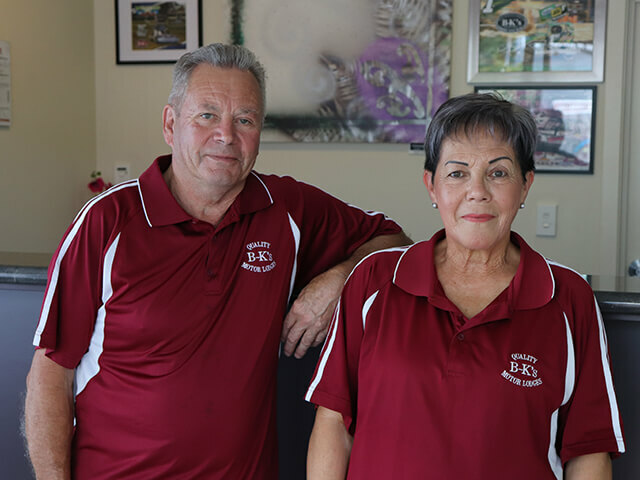 Since opening in 2009, B-K's has been providing families, groups, corporate customers and tourists with quality, luxury accommodation in the heart of Palmerston North. As part of the BKs brand, which has thirteen motels in the North Island of New Zealand, you are assured of great service, value for money and high-quality accommodation in Palmerston North whether you are staying for business, pleasure or sightseeing. Contact us today to book a room for your next stay at one of the most modern motels in Palmerston North. To ensure that you are entirely satisfied throughout your stay in our Palmerston North motel, we are on-site 24/7 to offer assistance when required. Reception is open from 7:00am until 9:30pm Monday to Friday, Weekends and public holidays, 8:00am until 9:00pm. BKs Palmerston North is located directly opposite the Arena Manawatu, the primary sport and event complex in the lower north island which holds a number of events from 36 different sporting codes to tradeshows, functions, festivals and meetings. Palmerston North City centre with it is shops and restaurants is a five minute walk away while a 3 minute walk will get you to local Cuba Street restaurants, cafes or shops. If you are planning on adventuring further afield in the Manawatu-Wanganui region to experience the Fielding Farmers Markets, Rangitikei river gorge rafting, Tui HQ in Mangatainoka, or the Manawatu river pathway BKs Palmerston North Motor Lodge is the ideally located base for your trip. When you choose BKs Palmerston North Motor Lodge as your Palmerston North accommodation provider you get the twin benefits of the local knowledge of the motel hosts, backed by the nationwide experience and support of the BKs brand. All BKs motels and lodges are rated at least 4 Star plus quality and maintained to the highest standard complimented with competitive prices and well-trained staff. If you are looking for high-quality self-contained accommodation in Palmerston North, look no further than BKs Palmerston North Motor Lodge. Book now or give us a call on 0800 222 830 to find out how we can help you make your next trip to Palmerston North one to remember!